Hey there trainers! Rukan here. It’s been over two weeks since Madison Regionals, where a version of Buzzwole-GX / Lycanroc-GX deck with three copies of Buzzwole made its big debut. The meta shifted rapidly since the Regional — players scrambled to adapt their list to this oppressive new Buzzwole variant. In this article, I begin by reviewing my thoughts on the three core archetypes; Buzzwole, Zoroark-GX, Malamar; and how they’ve shifted in the meta since Madison. Then I’ll discuss some rogue archetypes briefly. Finally, I will close with my thoughts on what decks to consider for your particular metagame. While I wouldn’t draw any strong conclusions from such a small sample size, it would seem lists with higher Energy and Max Elixir counts saw greater success than lists that opted for thicker lines of Lycanroc-GX and/or Octillery. I suspect this was due in large part to the surprise factor of running such thin lines of important Pokemon. From what I’ve heard, players at the tournament took notice of these thin lines in the latter rounds of the tournament and began to apply significant pressure by targeting Rockruff and Remoraid. Based on this feedback, I would still try to fit a 2-1 Octillery line to protect myself from opponents aiming to target my Remoraid. As for the Lycanroc, I would actually deliberately ignore the Madison results and find space for a 2-2 Lycanroc line. Why? Recent League Cup results indicate all Malamar and some Zoroark decks have adapted to deal with the threat of baby Buzzwole. A thicker Lycanroc line allows a Buzzwole pilot to answer counters such as Mewtwo Promo and Trevenant more consistently. Deck counts aside, I would not bring a Buzzwole variant to a League Cup in the upcoming weeks unless I knew for sure that a specific League Cup would not have many Malamar decks. Buzzwole decks have a huge target on their backs now after Madison, and League Cup results indicate players know how to counter the triple baby Buzzwole variant. But if I had to take Buzzwole to an event, I would try to bring a list with a greater focus on Lycanroc and lesser focus on baby Buzzwole to make my matchups more robust. If any deck can counter the threat of baby Buzzwole, it’s Malamar. And we saw exactly that happen at League Cups throughout North America. Based on League Cup reports I was able to find, Malamar variants earned nearly twice as much CP as Buzzwole / Lycanroc in the weekend immediately after Madison. Buzzwole / Lycanroc still earned a substantial amount of CP, but none took first place in any of the League Cups results I was able to find. Malamar decks adapted almost instantly and dealt a swift and decisive blow to the baby Buzzwole archetype from Madison. When Malamar players adapted to baby Buzzwole, many went to the Mewtwo Promo with the Pressure Ability. This Mewtwo stopped Buzzwole players from skewing the Prize race in their favor. It also reduces damage to Bench, disrupting a Buzzwole player’s ability to set up numbers on a Benched Dawn Wings Necrozma-GX. It even reduces damage taken by Shadow Stitching in the Greninja BREAK matchup, as that also made a significant showing at Madison. After the first week of Cups, some Malamar players felt comfortable enough with the Greninja BREAK and Buzzwole matchups, and looked ahead to once again beating Zoroark variants. One option was the Hoopa from Steam Siege. 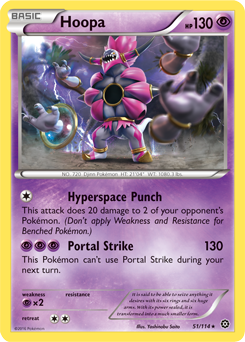 This one prize psychic attacker does not counter Buzzwole nearly as hard as Mewtwo, but it does enough damage to knock out a Zoroark-GX in two hits as well as set up Black Ray plays without need for choice band. Giratina should turn the Greninja BREAK matchup into an auto-win for a Malamar deck. The exact strategy differs from each Malamar variant. For Metal Malamar, you need to open with early pressure from your attackers that don’t discard Energy. Then eventually in the mid to late game, you want to use a GX attack from Ultra Necrozma-GX to fix your math. For Psychic Malamar, you want to pressure with Mewtwo Promo, Hoopa, or Mewtwo-GX. Promo Mewtwo and Steam Siege Hoopa both apply significant pressure while tanking a large number of Shadow Stitches. Mewtwo-GX can heal some damage with Super Absorption, but it’s not as good as Mewtwo Promo or Hoopa. Given Giratina also functions as a reasonable attacker in other matchups, I consider it a solid inclusion for Malamar lists. When I think of Zoroark-GX variants, Golisopod-GX and Lycanroc-GX come to mind as the two primary partners. I’ll discuss some less popular rogues in the sections below. How did Zoroark perform after Madison? On the week of June 9th through June 10th, it performed poorly. Based on Cups results, Zoroark / Golisopod and Zoroark / Lycanroc variants combined did not even earn half the CP that Buzzwole / Lycanroc earned. And as mentioned before, Malamar variants earned nearly twice as much CP as Buzzwole / Lycanroc that same week. Zoroark got demolished the first week after Madison, but began to recover quickly afterwards. A Zoroark / Golisopod won the Mexico SPE and Zoroark variants took 12 of the 32 day two slots at Sheffield Regionals, compared to the seven slots taken by Buzzwole variants and nine by Malamar variants. It would seem that after the first wave of Malamar players adapted their lists to beat Buzzwole, players adapted quickly yet again and began to play Zoroark now that Buzzwole variants started seeing less success. In review: Madison brought a powerful new Buzzwole variant into the light, crushing Zoroark out of the meta. During the first week after Madison, the meta adapted swiftly and Malamar players saw success mowing down Buzzwole variants with their own single-Prize attackers. During the second week after Madison, we saw a resurgence in Zoroark decks as players expected Malamar to once again keep Buzzwole variants in line. 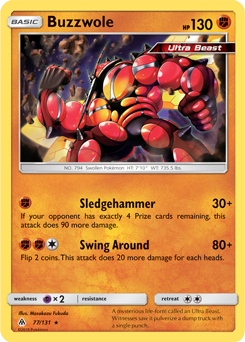 In the upcoming weeks, I would expect a slight resurgence in Buzzwole decks, but nothing too significant. Overall it feels like Madison further solidified the rock-paper-scissors aspect of our current metagame: Buzzwole decks run more baby Buzzwole, which further swings the Zoroark matchups. Malamar decks run one-Prize Psychic attackers to compensate, but these do not perform very well against Zoroark decks. And traditional Zoroark decks don’t have clean answers for baby Buzzwole.